← A Couple of Rough Days….. I so apologize for taking forever to let you guys know but………WE ARE HOME!!!!! We were able to leave the hospital on Friday afternoon after getting an “ALL CLEAR” from radiology. When we last “spoke,” Mark and I had just been told by the resident doctor assigned to Cannon’s case that he would need to finish the 3rd gallon of “Go Lytely” solution and begin a fourth. We were so sad. Sad that our sweet, trooper of a little guy would need another 24 hours of medicine. He was so done, begging for some real food, and pleading with us to take the N.G. tube out of his nose. But a couple of hours after my last post, all of a sudden, the “evidence came forth” to prove to us that things were getting better. I will spare you the details but it became very obvious that the final “pocket of a problem” that was in his colon was passing. About 8 diapers and 10 hours later, I was sure all was well. And I asked them to x-ray Cannon. The docs agreed, the x-ray was performed, and during rounds we all stood around staring at a computer screen image of my little man’s insides. Perfectly clear and healthy ones might I add! We were sooooo relieved!!!! It was determined at that time that we would pull the N.G. tube after giving him another dose of Valium. But we were going to leave the I.V. in until we were sure that he would eat and drink. He had been on strike from both for over 24 hours! Yet, another aim at gaining some control, I guess. Mark, myself, Cannon’s nurse, and 2 Patient Care Techs were all apart of the “pulling out process.” We each held a body part and the nurse loosened the tape that was holding the N.G. tube on his face and then quickly pulled the LONG tube all the way out. A huge sigh of relief was breathed by all of us! 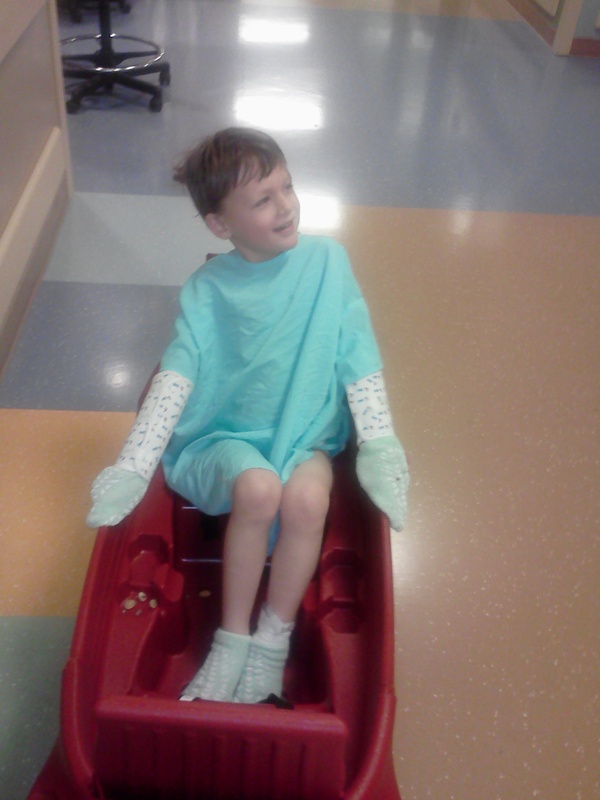 His nurse then unhooked his I.V. so he could be free of the I.V. pole. We could re-attach it later if that was needed. But it wasn’t. Cannon quickly drank 2 cups of juice and 1 of milk. He ate 2 cups of applesauce, some broiled cod, and an entire large baked potato. He then wanted more milk. Our next mission (after “Operation Hydrate and Stuff Your Face”) was to go to the playroom! Cannon was thrilled and wobbled around with a big smile on his face. (He wasn’t super sturdy because of the Valium so Mark or I had to follow him around and “spot” him. 🙂 But he got tired fairly quickly so we located a wagon and just walked the halls…. enjoying being tube free! He was so happy! After seeing that Cannon had eaten and drank PLENTY, the doctors began getting his discharge paperwork ready. The I.V. was pulled and I put Cannon in the shower. He must have felt so good when he was all clean, lotioned up, and in fresh, clean clothes. For the first time in 5 days. I also began work on the checklist I mentioned in a previous post. Of all the things that I want to remember for next time. Which meds work and which don’t, tricks that make things easier, necessities to bring to the hospital, requests to make to the docs, and the size of feeding tube. (Still kicking myself for that one!) I plan to type it up and put it in Cannon’s medical binder for next time. When we arrived home, I went to get Cannon out of his car seat and he was doing something he does often. Writing. He writes on everything he can constantly. It is his latest obsession. He simply uses his finger and writes words he sees from books, t.v., or just thoughts that come into his head (scripts) on couches, counters, his body…….any surface basically. Sometimes he will say what he is writing while he is doing it and sometimes not. This time he was and it touched my soul when I realized what he was saying. I often listen to youtube videos of my favorite Christian artists while I am cooking or cleaning. Cannon became particularly fond of one song and video and asks for me to play it often. He says, “Hear that song about the Lord?” 🙂 And I know exactly which one he means. The song is called “Everyone Needs A Little” by Kari Jobe. We even listened to it and sang along a couple of time when things were rough in the hospital. This particular video is a lyric video that someone other than the artist had made. There are a few verses typed on the screen during instrumental portions of the song and Cannon always asks me to read them to him. When I got him out the car Friday, I waited for him to finish as my heart melted. He was writing on his leg “So do not fear, for I am with you; do not be dismayed, for I am your God. I will strengthen you and help you; I will lift you up with my righteous right hand.” Isaiah 41:10 I mean, is he every Mother’s dream or what?!! Now, please enjoy this song that my sweet Cannon loves so. Let it minister to your heart about the assurance we have in a loving and faithful God. The eternal hope that we have because of Jesus Christ. And the intimate relationship that is possible if you merely repent, believe, and accept all that God has to offer you. There is peace, rest, and healing in the arms of God, my friends. And I pray that you will come to know this if you don’t already. Once again, thank you friends for praying us through our recent struggle. God bless each of you!